Again, the International Monetary Fund (IMF) has warned Nigeria and Sub-Saharan African economies to check rising levels of debts, diversify their revenue bases or face crisis. The IMF issued this latest warning at the just concluded IMF/World Bank annual meeting in Bali, Indonesia. It had earlier warned Nigeria over its rising debt profile which was N22.3 trillion as at June 30, 2018. It was reported that about two-thirds of the government's revenues go into servicing interest payments, with the principal still waiting for redemption. The IMF pointed out that strengthening fiscal positions was necessary to reduce debt vulnerabilities for Nigeria and Sub-Saharan African economies. In what appears to be a positive response to the IMF warnings, the federal government last week indicated that it was seriously planning to drastically cut down on its borrowing spree in the 2019 fiscal year. The Minister of Budget and National Planning, Senator Udoma Udo Udoma, revealed this at a public consultation on the 2019-2021 Medium Term Fiscal Framework (MTEF) and Fiscal Strategy Paper (FSP) in Abuja. He explained that borrowing was critical when the country was short of funds to bring out the economy from the recession it entered in the second quarter of 2016, but that the federal government will greatly slow down on borrowing next fiscal year. A report from the Nigerian Bureau of Statistics ,NBS, indicate that Nigeria's total external debt stock stood at $22.08 billion (₦6.75 trillion) as at the end of the period ending June 2018. This shows a quarter on quarter debt growth of 0.05 per cent from $22.07 billion in the period ending March 2018. However, out of Nigeria's total foreign debt of $22.08 billion as at the end of the second quarter of 2018, federal government accounts for $17.83 billion, which is 80.76 per cent of the total foreign debt stock. The 36 states and the FCT account for the remaining 19.24 per cent of the nation's total foreign debt portfolio, with a joint debt of $4.25 billion. The report equally indicates that Nigeria's total domestic debts as at June 2018 were ₦15.63 trillion ($51.12 billion). This shows a quarter on quarter growth of 24.24 per cent from ₦12.58 trillion in the first quarter of 2018. The 36 states and FCT accounted for ₦3.47 trillion ($11.37 billion), while the Federal Government was responsible for ₦12.12 trillion ($39.75 billion). Although the federal government has given assurance that its borrowing plan is still within the acceptable threshold as well as its commitment to diversify the non-oil sector, we believe that the nation's economy still needs a major boost from policy implementations that can trickle down to the average Nigerian. While borrowing might not be bad in its entirety, we believe that for the nation's economy to grow, the government should spend wisely in critical projects that can stimulate economic growth. It is imperative for the federal government to urgently implement policies that will grow and diversify the revenue base of the country to avoid imminent debt crisis. At the moment, Nigeria's rising debt profile remains higher than revenue growth. Also, the country has the lowest government revenue to Gross Domestic Product (GDP) ratio at six per cent among some selected countries. Experts have said that Nigeria's over dependency on crude oil revenue, combined with volatility in both the price and production of the commodity are major reasons for sluggish growth in government revenue. Growing non-oil revenue will require that the Nigerian economic environment develop inherent structures that can support business growth. Such structures include adequate physical infrastructure, policies, legal and regulatory frameworks that will make the economy business friendly to generate taxable profits. Findings showed that of the ratio of the interest payment on domestic debt relative to the federal government's allocation from the Federal Account Allocation Committee (FAAC), Nigeria is spending too much of its revenue to pay interest on loans. This leaves the government with little resources to spend on critical sectors of the economy that could support strong growth and maintain a healthy economy to generate revenue. We believe that policy formulation and implementation have always remained the divide between Nigeria and its economic growth and development. 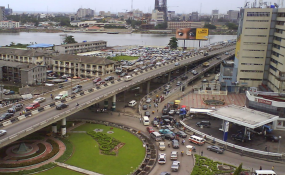 We urge the federal government to spend more money on infrastructure projects to revamp the economy. If government spends money on infrastructure, it would have multiplier effects on the economy, lead to job creation, increase economic activities and household incomes. In terms of structures and reforms that are on-going, the country has seen an improvement, but people still remained poor. Investment in infrastructure, in our opinion, will boost the economy into prosperity.